Just a few days before Christmas last year, residents in a California neighborhood spotted a strange-looking visitor roaming from yard to yard and rummaging through their garbages. The large animal had huge paws, a nubby tail and big, high-set ears. She was almost completely bald, with pink, scaly skin and barely-there wisps of hair along her back. Many were left guessing what type of animal she could be. That’s when the Fund for Animals Wildlife Center (FFAWC), an affiliate of the Humane Society of the United States, came in. 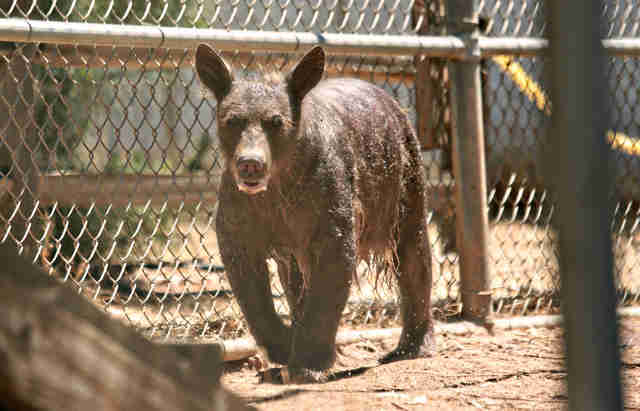 The creature was no stranger to them at all; she was actually a black bear — who just happened to have a horrible case of mange. She had been sick and struggling to find food for a very long time. 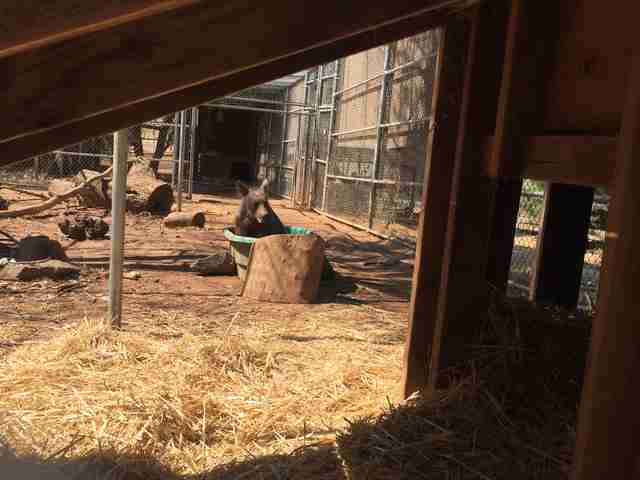 Exhausted and near emaciated, the bear arrived at the FFAWC center the day before Christmas. Her rescuers named her Eve. For the next eight months, Eve would undergo a fight for her life. Her caretakers settled her into her own bear apartment complete with comfortable blankets, some igloos to hide in and a fuzzy stuffed toy to keep her company. 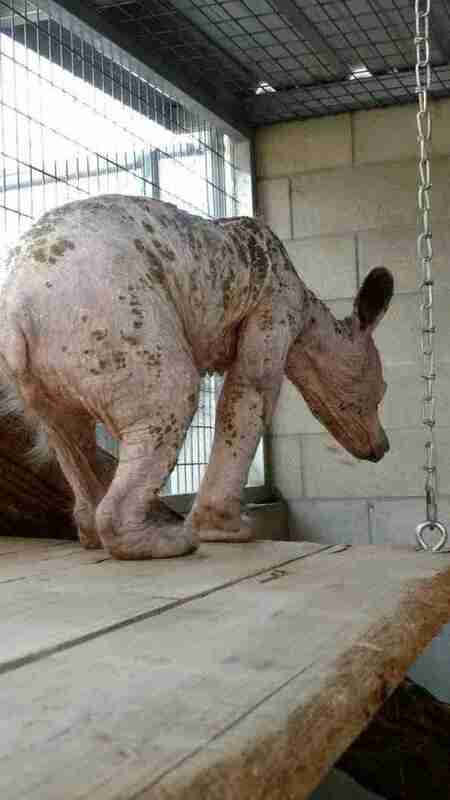 She required multiple blood tests, skin biopsies and medicine to continuously treat and reassess the aggressive mange. Eve’s medication slowly but surely diminished the mange, and she finally started gaining weight and growing thanks to a proper diet of tasty fish, fruit and nuts. Now, Eve’s hair is growing back — and she’s looking the healthiest she’s been in a long time. 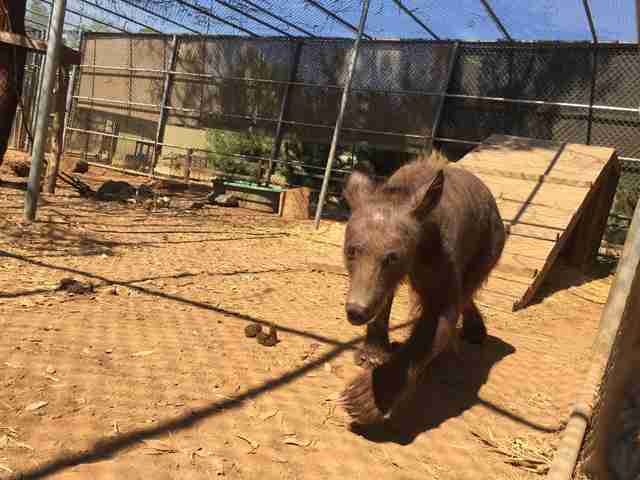 Although rescuers thought Eve was a young cub at first, they now estimate that she’s actually a few years old. With her newfound health, she’s exhibiting all normal behaviors of a black bear her age, including foraging for food, climbing and exploring. 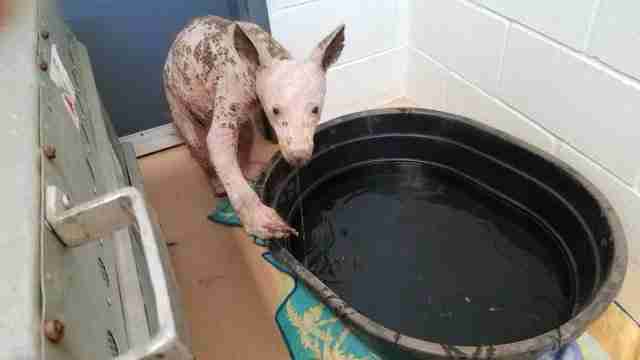 While Eve’s mange is completely cleared at this point, she’s still being treated for a secondary skin infection. This should subside over the next few weeks with the help of medication. The team will continue assessing Eve’s behavior, weight and fur growth over the next few months for more signs that she’ll be ready for release back to the wild. To support Eve’s ongoing recovery, you can make a donation to the Fund for Animals Wildlife Center.